What is Monuments in 3D? Monuments in 3D uses decades of experience in 3D Imaging to empower conservators, historical societies, museums, and community associations to preserve and restore cherished sculpture, monuments and plaques. Fill out our contact form to see how we can help. that can be used for digital documentation, manufacturing, analysis, visualization and design. The slideshow to the right depicts objects in the process of being scanned. CAD stands for Computer Aided Design. CAD was originally developed in the 50's and 60's for the automotive and aerospace industries to improve efficiency by relying on computers for complex curve calculations and construction. Development of PC based CAD systems has resulted in almost universal adoption of CAD for Design, Construction and Manufacturing. Modern CAD enables objects and assemblies to be completely designed in a computer complete with dimensions and material properties. CAD designs then can be visualized, analyzed, prototyped and manufactured through a broad spectrum of downstream applications and technologies. While most CAD is used for designing digitally "from scratch", 3D Imaging enables objects from the real world to be "captured" and imported into the CAD design environment. How can 3D Imaging Help Preserve and Restore Monuments? 3D Imaging provides accurate, thorough, 3D digital documentation that enables preservation and restoration in many ways. Digital documentation provides a historical record that can be stored with redundant backup, just like a document. Digital models can be studied, compared, and analyzed and modified for conservation and restoration research. Digital restoration can bring objects in ruin back to their original condition. Virtual models can be shared, viewed, animated etc through the internet, expanding accessibility and reach. "3D data" is the resultant digital documentation that comes from 3D Imaging. "Raw data" is typically in the form of a cluster of 3D points known as a "point cloud". The point cloud is made up of hundreds, thousands or millions of individual data points represented in a 3D coordinate system (x, y, and z axis). The images to the left and right are of 3D point clouds. Data can be processed into a various types of "3D digital models" that serve different purposes. What is a 3D Digital Model? The Emmeline Austin Wadsworth Fountain was laser scanned for the Association for the Preservation of Geneseo to provide accurate documentation of the fountain, particularly the capital. This digitally restored version will be used to make an exact replica replacement of the fountain when needed. How much does 3D Imaging Cost? Our goal is to provide you with the least expensive solution that meets or exceeds your needs. Project costs vary by the level of effort (scanning and data processing) and travel costs involved. Reproductions and restorations are additional costs that depend on the size, material, and quantity of reproductions. Fill out our contact form and we will provide a custom quote. 3D Imaging yields hundreds, thousands or millions of 3D data points. Resolution refers to the density of data collected, or distance between 3D data points. Higher resolution means that smaller details are captured. Resolution requirements are application specific. 1 mm resolution would be to low to scan Abe Lincoln on a penny, but it would be overkill for scanning the Lincoln Memorial. 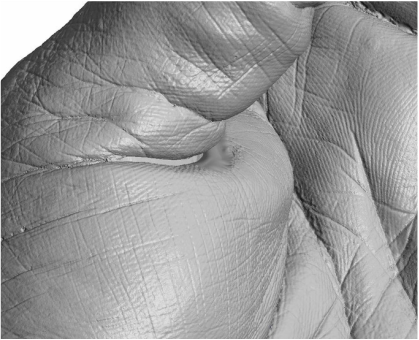 The images below represent high and low resolution 3D models of the same hand. What is the difference between digital restoration and traditional restoration? Digital restoration can be 100% non-contact and can be used to create a "digitally restored replica" without touching the original. Traditional conservation, almost always requires an artist to work with the original sculpture either by taking molds from it, or by working directly on the original. Our artists sculpt freely in the digital space. Using digital information, art historians, conservators, sculptors and fabricators can collaborate in real-time over the internet. The restored digital model can then be realized physically through digital fabrication. What is Digital Fabrication? How do Digital Models Become Real Objects? Digital Fabrication refers to the processes that make real objects from 3D digital files. There are generally two types; "Additive Manufacturing" and "Subtractive Manufacturing". Additive manufacturing cuts the digital object into slices (cross sections), and then builds the physical object in layers, one slice at a time. Subtractive manufacturing carves the surface of the digital object from a block of material. Both of these processes are described in more detail below. What is Subtractive Manufacturing? CNC Milling? or CNC Machining? These terms refer to the technology that carves tangible physical models from 3D digital models. CNC stands for "Computer Numeric Controlled" and refers to technology that drives a machine to cut complex forms using multiple-axis machining. Machining can produce very accurate models in a wide array of materials including wood, stone, and metal, varying densities of foam, plastics, wax and other modeling materials designed just for milling. Depending on the materials used, milling can create casting masters, or finished works. What is Additive Manufacturing? 3D Printing? or Rapid Prototyping? These terms refer to technologies that build tangible physical models layer by layer from 3D digital models. There are a many types of machines and processes, array of material and quality options for creating smaller, complex higher resolution forms, perfect for creating exact replicas in miniature. What is a Digital Rendering? A digital rendering is a digital photograph produced by a computer of a digital model. Within software, the artist can manage material properties (color, shininess, texture, etc) as well as camera angles, lighting, and lens properties. Once the scene is set up, the shot is taken and then the computer "renders" or generates the image. 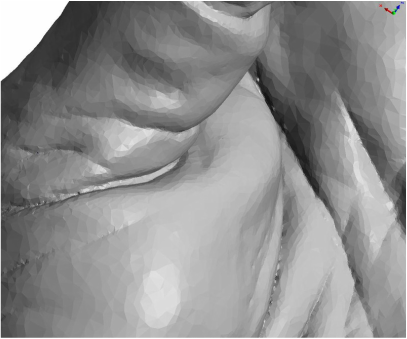 The larger and more complex the image, the more computer processing and time is required to generate a rendering. Computer animation is created by rendering each frame of the animation one at a time. When completed, all of the frames are shown consecutive to form a movie. Can I restore a Monument from photographs alone? This can be done, but can be very difficult and or cost prohibitive. The best answer is "it depends." It depends on the complexity of the sculpture, budget, the quality and quantity of the the photographs, and any additional information such as dimensions or remnants that are available.